Date formating in QGIS using expression? returns current date as 15/4/2019, but I want to get the date in dd/mm/yyyy format i.e. 15/04/2019. How can I get that using QGIS desktop version 2.18.12? You need to use the format_date expression. 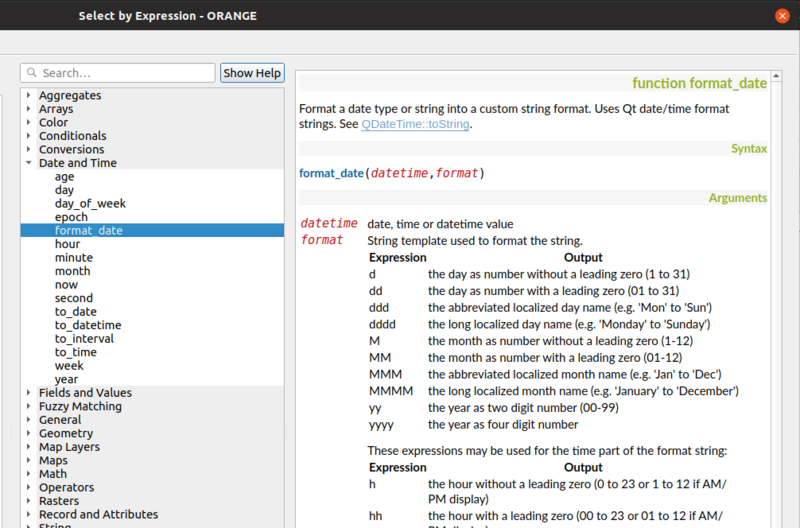 Please read the documentation of the format_date expression in QGIS Expression dialog to have all possibilities. Not the answer you're looking for? Browse other questions tagged qgis field-calculator qgis-processing or ask your own question. Does QGIS support parsing of date strings in tables? Calculate QUARTER from Date field using ArcGIS Field Calculator? Selecting numbers within the slash (/) using ArcMap Field Calculator? Making automatic updated date and time field in QGIS?